The Pointer is still a relatively popular breed in North American and across Continental Europe. But in it’s homeland, the UK, the breed has languished at the low end of the popularity list for over 100 years. The downward trend in the Pointer’s fortunes was detected as early as the 1850s, only about 130 years after its introduction to Britain and by 1900, William Arkwright wrote that No doubt, at present, the future looks rather gloomy for the pointer”. By 1938 things were even worst, prompting Wentworth Day to describe the Pointer as a graceful, gallant, but alas! diminishing breed, and hoping that this magnificent sporting dog will never be allowed to entirely die out. So what happened? Why did the Pointer’s star burn so brightly for such a short time in the UK? In the excerpts below, two of the major factors that contributed to the Pointer’s decline — changes in agriculture and shooting styles — are discussed. Happy Reading! Who can forget his first partridge ? I for my part and I believe that my memory is very much the memory of every gunner, can call to mind the very spot in the very field in which breathlessly I slew my first bird. It is a good many years ago now, yet I recall clearly each circumstance of that great event. I remember well the ancient brown walls and deep thatch of "the Old Barn" hard by, a Northampton- shire barn, bearing on its warm sandstone gable-end the date 1642. I remember crossing "the Old Barn ground " and then entering a piece of fallow, where I knew that some birds lay. And well I remember walking that fallow with a beating heart. I was alone, armed with an old single muzzle-loader. The whole scene at this moment rises clear before me. Three birds get up within easy shot ; I take aim at the nearest and fire, and to my astonishment and delight down drops to the red earth my first partridge. The indescribable rapture of that moment can never fade. And when, in the piece of clover to which the odd brace have betaken themselves, I positively bring down another bird, my measure of happiness is indeed complete. 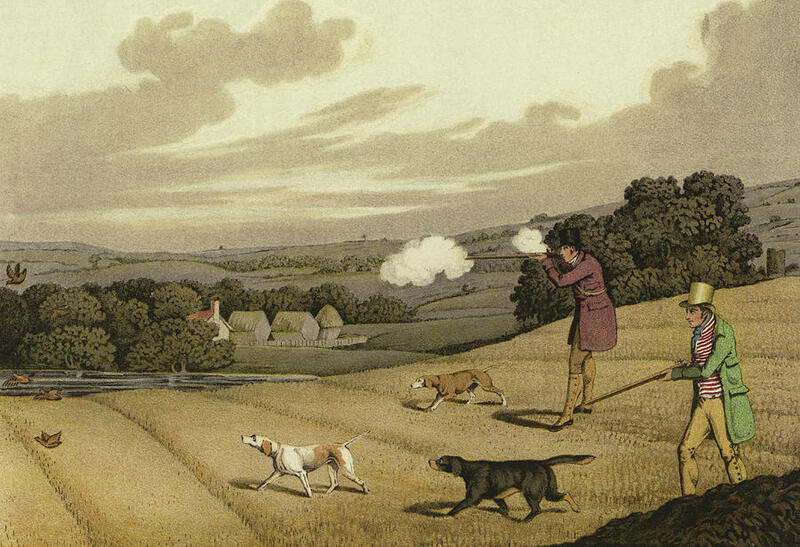 That first joy of the youthful gunner can never again be quite recalled ; yet, to the average healthy-minded man, September days spent in the pursuit of partridges bring about as much happiness as is to be extracted from this vale of care. 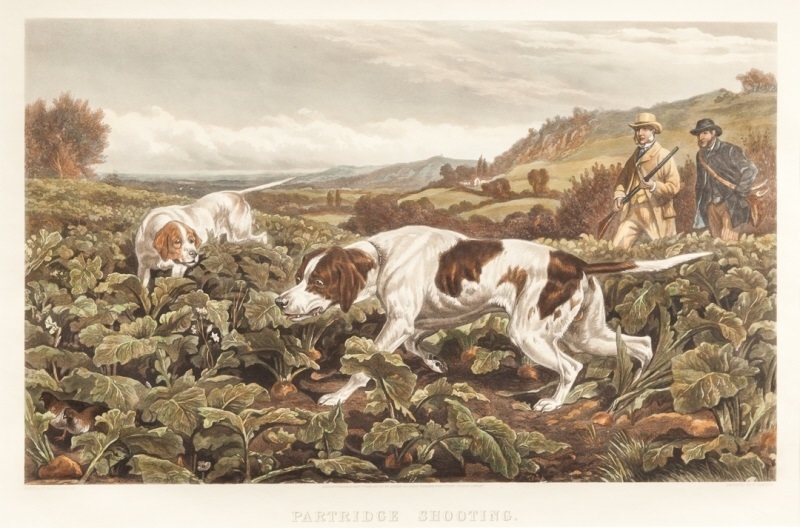 The beginning of the twentieth century, with its complete departure from the old partridge-shooting ways and ideas, its wonderful improvements in guns and powder, and its extremely scientific methods on large estates, where huge bags are expected and made, may have brought partridge-shooting within the reach of far more gunners than of old ; yet it may be questioned whether, for pure pleasure of sport, we are any better off than were our grandfathers, with their flint or percussion guns and deliberate habits. The keen delight of shooting over dogs is more and more becoming a thing of the past. For my part I can never cease to envy the sportsmen of the first three-quarters of the last century, who shot over pointers and setters, took their time, walked steadily all day, and were content with moderate bags. It is, however, a mistake to believe that the immense bags made by modern gunners at big partridge drives are new to gunnery. 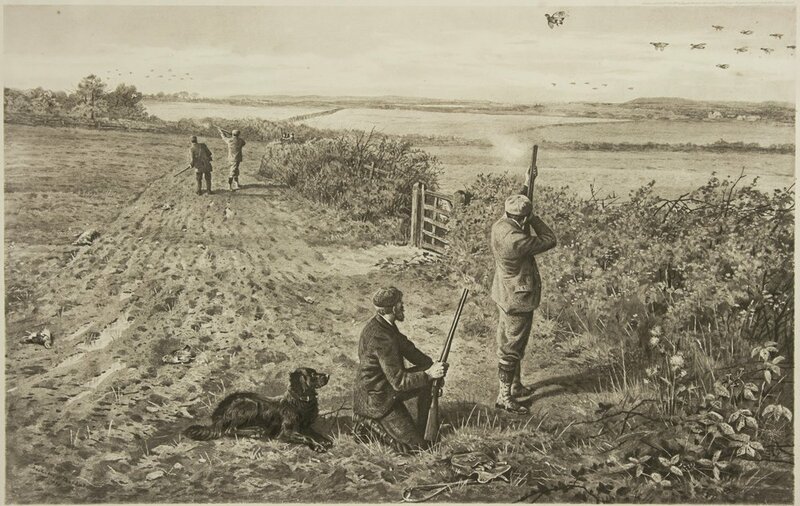 On the great sporting estate of Holkham, in Norfolk, where for generations partridge-shooting has been a passion, more birds were killed in the years 1797, 1798, and 1800 than in the two best seasons between 1860 and 1870. Upon other sporting estates very large bags of partridges were made before 1800, even with the old flint and steel weapon. Partridges in those days seem to have been generally even more plentiful than they are at the present time. In these years the season's bag at Holkham included 3,800, 3,965, and 3,865 partridges respectively. On the other hand, the number of men taking out licences to kill game was absurdly small, and the areas shot over by the gunners were immense. My own grandfather, who shot in quite a quiet way, had, with a neighbouring friend, besides their own property, the whole of the shooting for twelve miles in a crow's line, in the counties of Warwick and Northampton. They were the only gunners of their particular neighbourhood, and, with their old-fashioned early English pointers, they ranged through quite a host of parishes. And in those days, be it remembered, they paid nothing for their sport, beyond giving away a certain percentage of their birds to the farmers whose land they shot over. In the first quarter of the nineteenth century the men who handled guns and shot birds flying were few and far between, and the taking out of a game licence was quite a solemn performance. Now, everybody must shoot, and to the plethora of gunners, undoubtedly, much of the decay of the older and quieter and, we may say, perhaps, more enjoyable form of sport is to be attributed. Modern farming and lack of covert has of course a good deal to do with the exile of sporting dogs from the field, but driving and walking up on a large scale owe their origin not a little to the increase in numbers and to the more busy habits and even the impatience of the modern sportsman. And yet, what a wonderful charm there was and still is in quiet places in shooting over dogs, and steadily pursuing the partridge through golden stubble, tender clover, and lush fields of roots, dripping with autumn moisture ! The very pleasure of seeing a well-broken pointer or setter, or still better a brace of them, work is worth many a big bag obtained by the somewhat mechanical processes of modern walking up in line or driving. Driving, which nowadays claims so many ardent votaries, has of course much to recommend it. It appeals to busy men who cannot afford time to be pottering quietly about, and to be content with small bags. A few big shoots in the season, with heavy bags at the end of them, suit the multitude, in these days of stress and hurry, far better than sport more evenly distributed and moderate bags. Yet it is unquestionable that the modern shooter who waits under hedges for driven birds, or, a mere unit in a line of gunners or beaters, walks up his birds without the aid of setters or pointers, misses a great deal of the purest essence of sport and woodcraft. Shooting is becoming far too much a cut-and-dried pastime, a mere machine-like process for slaughtering game. It is a somewhat melancholy sign of the times, when one peruses recent books on partridge-shooting and finds no reference whatever to pointers and setters. Who that has seen dogs work in the field can ever forget the thrill of pleasure and expectancy with which one notes the staunch setter, after a careful range, draw-ing stealthily upon his game? Who can forget the attitude, motionless as a statue of bronze, of a pointer close upon the covey? Who can measure the feeling of delightful expectancy with which the gunner approaches the setting or pointing dog, or that supreme moment when at last the birds rise and he gets in his two barrels ? Such episodes add fifty-fold to the charm of shooting. Those old-fashioned gentlemen who went into the stubbles on the first with their Dons and their Pontos had a far better time of it, in reality, than the sportsman who drives to his shoot, kicks his heels under a hedge, bags his driven birds now and again for a few breathless minutes with the echanical precision (or otherwise) of a Carver or Bogardus, and, as likely as not, gets a thorough chill to go home with. The modern shooting man is, I fear, too ambitious to be merely a "good performer"; he can kill his birds in excellent style, but he sees little of real sport, which I take to be the finding with care and difficulty, as well as the killing, of your game. However, we may console ourselves with the thoughts that here and there, even in this year 1904, one can still accomplish the rare feat of bagging a brace or two of birds among the corn stocks. There are still quiet bits of countryside, almost forgotten back-waters, left by the rapid stream of latter-day sport, where the corn is still occasionally cut by hand and not by the smooth-shaving mowing machine ; or perhaps, the crops having been laid by wind or rain, the sickle has to take the place of the machine, and there is good lying for the birds. What a real pleasure it is, with another gun or two and reliable dogs, to get out early into the stubble before the partridges have retired for their siesta, and follow the keen pointer or the more active setter in his quarterings ! There may be some potatoes to follow the birds into, or a field or two of turnips, or a piece of clover a certain find after the birds have scattered a little ; perchance we may even alight on those good old-fashioned luxuries, a field of beans or a bit of standing barley. If a man cannot hit birds rising at his elbow or under his nose from that magnificent background for the gunner's eye, a piece of fair white barley, he may go home and put up his gun. Was it not an old dean one of the almost forgotten school of divines who shot and hunted who upon his deathbed solemnly enjoined his son never to forget to keep for September shooting a patch of standing barley? An hour or two before lunch the bag is steadily mounting up, and the gunners and dogs may turn their attention to those odd nooks and corners that partridges scattered by the morning's shooting betake themselves to. And here the real knowledge of birds and their ways, too often unknown to the mere shooting man, comes in. Here begins something of the real woodcraft of the partridge-shooter. There is a world of art required for the proper securing of partridges driven to bethink themselves of those tricks of cunning of which these birds are in reality such masters. How close a bird will lie where covert is thick and grass and leafage are ample, and how hard a matter it often is to pick up a wounded partridge ! Here the steady, poking ways of the retriever or spaniel, hitherto led by the keeper, are often invaluable. Perchance during this bit of sport an odd covey of birds which left the cornfield earlier than their fellows, and are now sunning themselves on some dry knoll, may be encountered. The tribute of a leash is taken were they are beyond range, and the remainder are marked over yon tall hedge into some roots. The hedgerow sport finished, we cross a lush field of after-math, and the pointer quickly tells us that here too are some stragglers. From out the rich carpet of greenery we flush, one after another, a good brace, which, so close have they lain, fall easy victims. Before tackling the big field of swedes, lunch and a pipe are discussed, and then once more we are afoot. The mellow afternoon wears on, the bag mounts up, and at 4.30, as we count out the slain on the smooth lawn in front of the old white house, there lie before us eighteen brace of birds, a brace of landrails, half a dozen rabbits, and a hare. A modest total, it is true ; yet such a bag, made over dogs, is in the mind of the quiet gunner worth fifty, ay, a hundred brace of driven partridges. "Your correspondent, 'Index,' apropos of my article on this subject, asks two questions. One you have answered ; it gives me much pleasure to reply to the other. The ground is largely grass land, old pasture, and young grass. There are some allotments, with the usual crops, and there are a few small root fields. The object of the article was to encourage the use of dogs. The following particulars of this [season's bags over dogs may help in the matter, and at the same time convince ’ Index ' that such sport is not fanciful. Birds plentiful, but mostly wild. Brace in September : 15, 9, 11, 23 1/2, i5 1/2, 12 1/2, 24, 7 1/2, 19, 14 1/2, 9 1/2, 10 1/2, 9 1/2, 131/2, 10. In October : 7 1/2, 20, 141/2. All these bags were made over dogs. (Signed) L."
These figures seem to me excellent. They offer clear proof that "dogging," although it may be in its decadence, is not yet quite a thing of the past. They should encourage those who still have a fancy for quiet sport of this kind not to be laughed out of their pleasures by men who believe only in big shoots, big lunches, and big bags. In the same number of the Field in which the above letter appeared another sportsman wrote to say that he was one of a party of three guns who killed fifteen brace of partridges over dogs in a short day of four hours during the last week of September. And yet another writer added that on October 14th he had killed, to his own gun, nine brace of birds over a pointer dog, besides sundry " various." England changes but little in the procession of the years ; there is still plenty of sport and good-fellowship to be gleaned from the pursuit of the bird of September. For the average active Englishman " walking up " birds is an excellent pastime, giving as it does a fair amount of healthy exercise, with plenty of opportunity for shooting skill. " Half -mooning," if scientifically carried out, is a fascinating form of sport. Not only do the guns forming the points of the half-moon get their share of sport, but those birds passed by the widely extended horns rise at length, break back, and often afford magnificent shooting to the men composing the base of the figure. But, after all, " driving " is the sport that nowadays, as in grouse-shooting, seems to appeal to the greatest happiness of the greatest number. First practised, it is believed, only some five -and -forty years ago, partridge-driving has rapidly gained an immense hold on the shooting public. It has, admittedly, many and great fascinations : it appeals to every instinct of eye and hand ; and the man who can account for driven partridges featly and well, may reckon himself good enough to shoot anything. On a dry, clear day of autumn, with the warm, lingering touch of autumnal sunshine upon the air, when the crisp leaves lie lightly upon the sward, the blackberry sprays are full of crimson, and the pearly dew glistens upon every stem of grass, then, as you stand behind your hedgerow prepared for action, life seems to be very well worth living. And if you are good enough to stop your share of the brown, short-winged forms that skim whirring through the clear, still air, whether approaching or going away from you, then, having done your duty by your gun and your host's partridges, you may go home well content. In these days, when invention follows upon the heels of invention, the sportsman can, at all events, have but little to complain of in the matter of guns and gun gear. Smokeless powders have deprived shooting of half its former drawbacks. Smokeless cartridges, loaded by good makers, are usually so perfect, and are to be obtained at such reasonable prices, that black powder has become as out of date as the flint and steel itself. As for guns, they seem to be rapidly approaching perfection. Even the shooter of weak physique, or the lady gunner can now obtain a good, hard killing weapon, combining marvellous lightness with absence of recoil, so that shooting with it is a positive luxury. Sportsmen and women of this year of grace have indeed much to be thankful for. I often look at an old shot belt of my grandfather's, with its long, leather, snake-like bag, which buckled round the body and over the shoulder. From this engine of terror the shot were poured into a little brass scoop, which fitted with a catch into the top of the pouch. The contents of the scoop, then charged, were then poured down the gun-barrel. What an operation of itself only a part of the very serious business of loading for frozen fingers on a winter's day ! That belt was in use only sixty or seventy years ago. When one contrasts the ancient paraphernalia of shooting with the luxurious and labour-saving equipments of the present day, one can only lift up one's hands and exclaim, with Dominie Sampson, “ Prodigious ! "